Brisingr is the third novel in the Inheritance Cycle of books by Christopher Paolini. Regular readers of my blog will know that I was an instant fan when I read the first in the series, Eragon, and gave it 5 stars without hesitation. 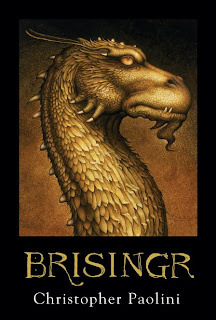 I was still on an adventure high in Alagaesia while reading Eldest and also gave it 5 stars, but somehow Brisingr didn't have the same grip on me as the previous two in the series. The author maintained his engaging writing style and the plot was filled with action, adventure, danger, bloodshed and magic. Eragon learns the truth about his parentage - which I didn't see coming - and improves his skill and knowledge on the run, all the while feeling the weight and tug of responsibility The Varden place on him and his Dragon, Saphira. In contrast to other book series, fans have an idea what's going to take place in the next book, we just don't know how it's all going to play out. Unfortunately though, we're going to have to wait a few months for the privilege. Inheritance is the last book in the series and will be released in November 2011; great timing for Christmas gift ideas. I recently read the first one, but I haven't started the second. I'm kinda bummed that you didn't like the third. Maybe the last one will save it for you. I'm sure it will, I absolutely loved the first 2. I guess it's hard to have 3 back to back perfect scores in a row. Do you think you'll read Inheritance? I can't wait for it to come out, and it's not long now... did you notice the countdown widget at the bottom of my blog? Lol! It's the big showdown, so should be full of action!